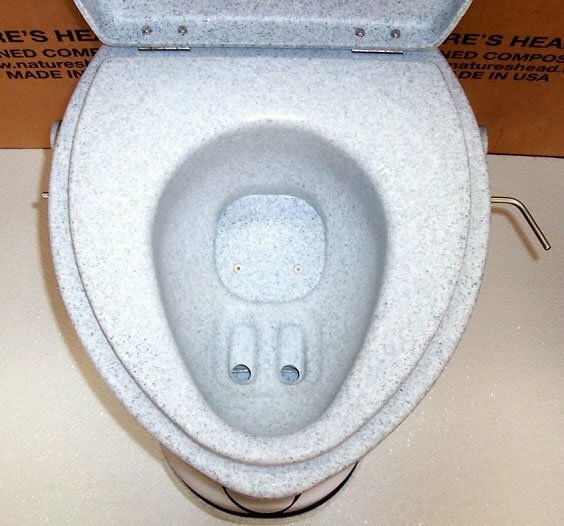 The key to the success of the Nature’s Head composting toilet is the urine separating design. The liquids and solids flow into separate chambers. You can see in the photo on the right there are two drain tubes in the bowl that should capture most of the urine. The solids drop down when you open the trap door (shown closed here). The urine collects in a removable bottle. Composting toilets have been slow to catch on, because of problems with odor. This has largely resulted from too much liquid mixed with solids. With too much moisture you don’t get compost – you get a stinking mass of raw sewage! By separating the urine from the solids these toilets solve this problem – resulting in odor free, trouble free composting. The Nature’s Head composting toilet is well made of heavy duty, roto-molded plastic and stainless hardware. It is not flimsy, like a port-potti. I can’t think of any way this toilet could break under normal use. The focus is on durability, simplicity and reliability. Proudly made in the USA – not China! Fair wages are paid. Strict environmental regulations are adhered to. Children are not employed. Unit comes with everything for your installation except the external vent. Fully supported liquid tank for applications where it extends beyond mounting pedestal. Translucent 2.2 gallon liquid tank allows for easy visual capacity inspection. Rear of main tank is angled for hull-side installation on boats. The electric receptacle for the 12 volt or AC adapter is conveniently located on the top right of the fan housing. There is minimal current draw. Power-free installation of the Nature’s Head composting toilet is possible with the optional solar vent.The vent hose is attached to the fan side. A wall adapter is available should you want to plug it in to a regular household type receptacle. Fan can go on either side. 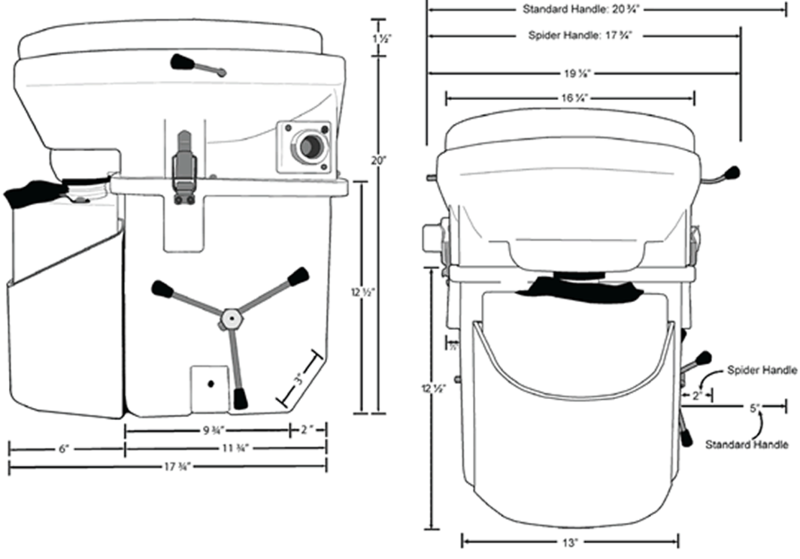 Here are the Nature’s Head composting toilet dimensions. You need an additional 2″ front to back, to allow for tilting the toilet top to remove the urine bottle (19.75″ needed, front to back). Note there are two handles that you can choose from – the crank handle, and the spider handle, which saves 3″ of space. spider handle – saves 3″ of space. Before using the Nature’s Head, and after each time you empty it, you need to put some coconut fiber (readily available) in the lower chamber, to help with composting. Below is an excellent video that explains how to do this. When it is time to empty the solids bin, you open it up and place a compostable garbage bag over it. Turn the bin upside down and dump the contents into the garbage bag. The entire process just takes a few minutes. The garbage bag can then be placed somewhere else to finish composting. Let it sit for about 12 weeks and you have finished compost. The finished compost can be placed on ornamental plants. Just to be 100% safe, you never put human compost on vegetables. A slightly more convenient solution is to buy a second bottom chamber. The bottom chamber is then just exchanged when full. Urine is sterile and does not pose a health risk. Still, you need to be careful where you dump it. Boaters and RVers can simply pour it in a regular toilet, outhouse or anywhere it is legal to take a pee. If the Nature’s Head is installed at a cottage, you could build a simple French drain. This is a small pit, filled with gravel, then covered with landscape cloth, soil and finally grass. A vertical plastic tube should be placed in the middle of the drain so you can pour the urine from the top down into the gravel. Some owners use a flexible plastic tube that runs right from the toilet into a French drain beside the cottage, so they never need to empty the urine container at all. There is a small 12 volt fan built into the toilet to ensure continuous air movement. It runs on a miniscule .08 of an amp, but you need a power source. A 12 volt battery works well for boaters or RV owners. A solar vent can be purchased as an option, which means it will run without outside power (nice!). Cottage owners can order a wall adapter, then plug it straight into any wall outlet. The vent exhausts outside. The small size of the Nature’s Head means it will probably not work for more than 2 people full time.The simplicity of the design requires a bit more involvement from the user than some of the larger, more expensive composting toilets. However, this simplicity is also a positive, since there are no mechanical raking systems or heaters to require maintenance or break down. The only thing that could possibly fail is the fan, and that is a standard computer fan that can be replaced for a few dollars. This toilet should basically last forever. The Nature’s Head is a well-made unit that does what it is supposed to do. 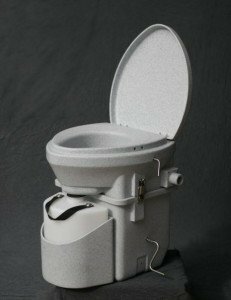 It is one of the least expensive composting toilets on the market, and will fit in very small spaces. There is a 30 day money back guarantee, (buyer pays return shipping, however) and a 5 year warranty. Should you need to return it, there is no “restocking fee” as there is with most composting toilets. It ships from Ohio by UPS, usually the next day. The Nature’s Head composting toilet is $960 including shipping. (Lower 48 states only. Call for shipping to other locations). You can read more at Nature’s Head USA. 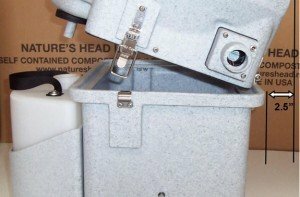 Purchase the Nature’s Head composting toilet here. You can read frequently asked questions about the Nature’s Head here. There is a detailed user’s guide here. Installation instructions and videos are here. Thanks again for being so prompt, skilled, and courteous in handling this order, Richard. Our society certainly would benefit from more folks like you. Much appreciated! I love it!! Thank you for coming up with this design for the Nature’s Head. My husband and I have crawled all over the web looking for something just like this and it’s actually affordable (when compared to toilets made by SunMar and similar companies). It frees up space where the black water tank would go. Hi, just a short note to tell you how easy it was to install our Nature’s Head. I bought two units and put one in while a cruising neighbor watched. He actually talked me into selling him one of my units and installed it in his boat. They work great! I’ll reorder a second one in a bit, I’m redoing my 12 volt system as part of a refit before taking a 3 year extended cruise around the world. I’ll continue to spread the word. You can purchase the Nature’s Head here. My partner and I have recently purchased a Natures Head toilet. Our problem is that liquids keep ending up in the solids compartment. Both me and my partner are the only ones to use the unit and both are being as careful as possible to aim directly into the holes. It is a small amount and not lots, but some is definitely getting in. We noticed the problem one time and have sine made a proper effort to aim correctly but last night I checked (we are just using the unit for liquids at the moment while we figure this out) and sure enough a small amount of urine in the solids container. Is there anything we can check / do / change to stop this happening? A small amount of urine is not a problem. However, there was a manufacturing defect and some toilets had a significant amount orf urine flowing in to the solids chamber. The issue has been resolved. Give me a call and we will sort it out for you. in the description of the Nature’s Head you state that some owners divert the urine with a tube to a french drain. 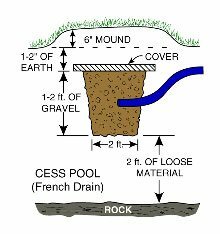 I understand the workings of the french drain concept but am curious how to hook this up with regard to how the Nature’s Head is designed? How and where do you connect the hose? Any other issues to know about regarding doing it this way. I’m weighing both the Nature’s Head the and Separett and trying to decide which one works best for my situation. I like the idea of the urine going directly out and no emptying but I don’t understand how you do it on the Nature’s head. With the Nature’s Head you would drill a hole in the side of the urine bottle, as close to the bottom as possible, and install a hose fitting. You need a corresponding hole in the urine bottle support. The urine bottle support should be unattached from the toilet base, and screwed to the floor, so you can empty the toilet without disassembling the urine drain system. I’m impressed with the info for both the Nature’s Head and the Separett toilets. From the videos I’ve seen it looks like the Nature’s Head makes compost right in the toilet; a big plus. Why does the Separett not require an agitator or peat moss? Would it work just as well or better if you did add peat moss? Since Nature’s Head makes compost, it doesn’t use a bag, what would happen if you didn’t use a bag in the Separett (I don’t like having to buy special stuff like decomposing bags)? What keeps the trap door from flipping down and getting in the poop? I like the look of the Separett better and it looks like it has a better separator and I like the child seat but if would be nice to have it make compost like the Nature’s Head. The two toilets use a different approach. The Nature’s Head as you say starts the composting process inside the toilet. The advantage of this is simply that much of the material (but not all) will be well on the way to becoming compost when you empty it. The material must continue composting outside in a bin or other container. However, unless you are in a hurry to have finished compost, or have very limited composting space, this is not an issue. The focus of the Separett is dehydration of the solid material – not composting. The poop loses all odor as soon as it starts to dry out, and it shrinks drastically inside the toilet. The actual composting then takes place in a bin outside. (As with the Nature’s Head). You definitely do not use peat moss or anything else inside the Separett. The bags can be bought at any hardware store and are cheap. The trap door swings horizontally for both toilets – it cannot drop down into the poop! How do you clean the inside of the bowl, like a normal toilet. It will get dirty, correct? Just spray it with water from a spray bottle, wipe it with a paper towel, and drop the towel into the toilet. It’s a big hole, and the bowl sides are vertical, so it doesn’t get too dirty. Are there any toilets made for children? My 3 year old won’t hit the hole when going.. and she likely won’t be able to separate #1 and #2, what do you recommend for these issues? The child’s seat is included for just that reason. Works very well. I have a delicate question. What do you clean the bowl with where the poo may have hit the sides before going down. Leaving a little left behind. Keep a spray bottle near the toilet, After use, spray the bowl, wipe it clean with a paper towel and drop the paper towel into the lower chamber. Some people have a toilet brush sitting in a container of water, and they use that. Either way, it is a bit more work that a flush toilet. You needs to do a bit more research. Urine is NOT sterile. A very interesting comment, and technically correct. Until quite recently, it was taught in both biology classes and medical schools that urine is sterile. This was challenged and investigated. A good study published in the Journal of Clinical Microbiology in 2012 found no living bacteria in urine. However, other studies have found tiny amounts of bacteria. Sciencenews.org reports that a study published in 2014 found tiny amounts of bacteria in urine. The theory is, urine is sterile in the bladder, but may become contaminated on its way down the urethra. I believe the consensus now is that urine may not be sterile. It’s an academic point however. It is either sterile or very nearly sterile, poses no health risk, and is safe to dispose of without treatment.